Another week has whizzed by and Wednesday is approaching fast, so it is time share our desks with the delightful Julia and all you lovely people. First of all, thank you for all your visits last week, and a moment to set the record straight. The flowers I 'ordered' for Julia, were only on my website, so Julia only got to enjoy them there, as did the rest of you, I hope. Actually they were the flowers my daughter sent me for Mothering Sunday last year. So to business, although I still have tendonitis, wearing a brace on my arm relieves me of some of the pain, if I am careful with what I do, using scissors is really painful, as is using my mobile phone or tablet, However making cards is good exercise as long as I am not putting too much pressure on my arms, so I have had quite a blitz, I finished some previously unfinished symphonies, made new cards, the eagled eyed among you might notice that I have used the die I showed you last week on three cards, and, Oh dear, I have more unfinished symphonies. I am particularly frustrated with the red card with the fan and lacy corner, anyone got some good ideas what else to do with it to make it look finished.? I also made some Easter cards, our church has very close link with the local school and there are some children there whose families are in very straighten circumstance, so we are putting together some Easter bags, a bit like the shoe boxes, but for the whole family, and we needed cards for the bags so I rustled up half a dozen, and it gave me the chance to use the new corner punch I managed to miss in last week's picture. 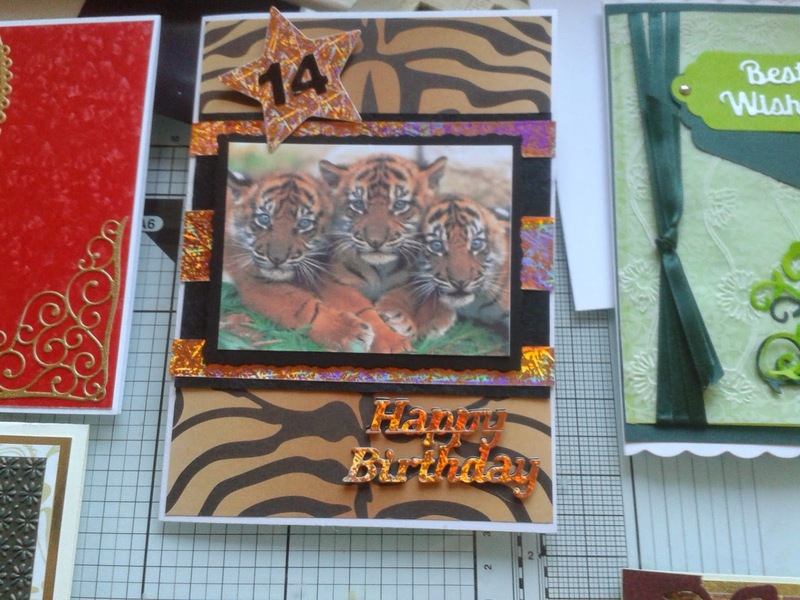 Then there was the requirement to make a birthday card for no 1 grandson, 14 years old on Monday and absolutely mad about tigers, his bedroom is a vision in black and orange, pictures, blankets bedding and floor cushion, so at least I had a theme to work with. Well I am having serious problems with Blogger so I will say Happy WOYWW, have a great week and thank you for dropping in. ah Chris so really beautiful cards there ... too hard to pick one .... but must admit the fan die is really eye catching .. lovely! Thanks so much for sharing ~ happy WOYWW! I do hope your arms improve very soon. 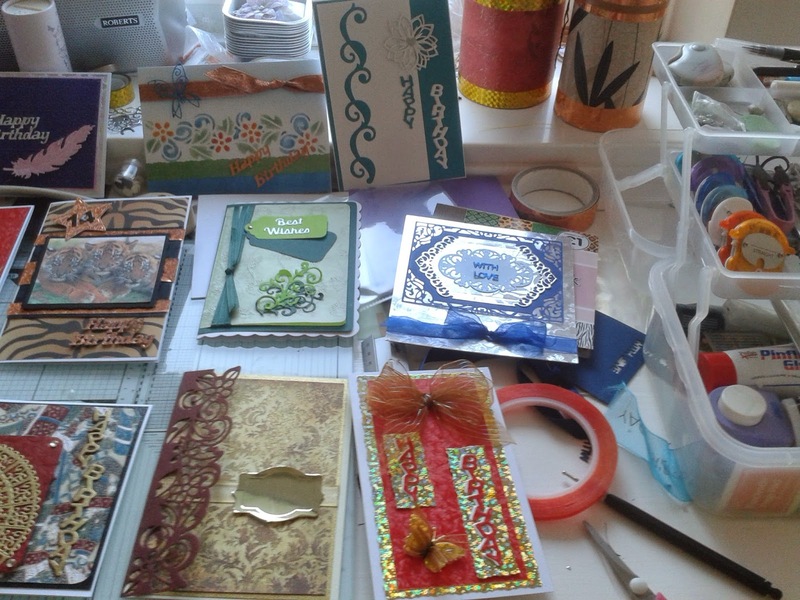 You have been using your time well and made some beautiful cards. Morning Chris. Good to see you have managed to get so many bits done. The cards are great - well done. The fan card? I'd cut a long thin piece of probably, gold, card with a nice edge, put a sentiment on it, and place it diagonally in the gap... Any good as an idea? 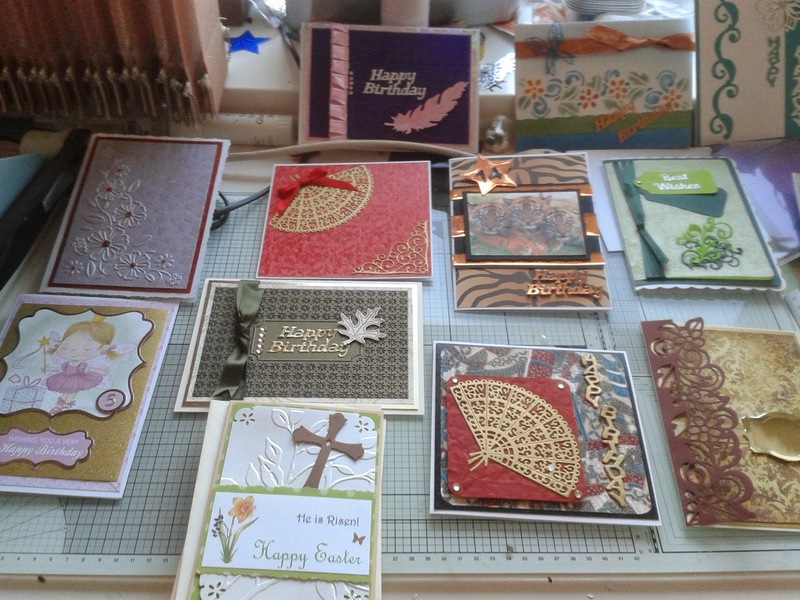 You've been very busy for an injured crafter! I love the Easter card. Chris, what absolutely gorgeous cards, and what variety! I particularly love the tiger one - I adore tigers, and I think my absolute favourite pages in the mini-album I made last year about my Dad were the pages about the tigers... My hubby has promised to take me to the zoo before I go into hospital, so I can get a tiger fix! I am sorry to hear about your suffering from tendonitis. It must be very frustrating, wanting to do things and the thngs you enjoy causing you so much pain. I do hope that the brace will help, and that you will soon recover. Hi Chris, I think that must be the purpose behind this second postponement - the Lord teaching me patience, lol!!! I don't feel so bad about it now, although I was pretty frustrated and fed up when we first heard. There's nothing to be done about it and I've just got to wait till we get a date. Not having a date is the worst part of it because it makes forward planning so difficult. We really are captives of the hospital's whims, aren't we! (Not that this postponement was a whim - I feel very sorry for my surgeon, having to deal with a family crisis serious enough to make him take time off work at such short notice - I wonder what on earth can have happened?) No doubt we will hear in due time, and I am now anxious to get this over and done with because the cancer is still there and needs dealing with.